Lili is a 13-year-old who’s being shuttled from her mother to her father and whose best friend is her dog Hagen. Unfortunately her father doesn’t want the dog; their apartment complex has strict rules about pets, and Hungary in general seems to have some strange dog-related laws such as having to pay a fine for owning a mixed breed dog. When Lili’s father leaves Hagen on the side of the road, Hagen sets out on an adventure both delightful and sad as he is accepted into a community of street dogs, but also experiences the horrors of dog fighting. Ultimately these experiences bring Hagen to some dark places causing him to revolt along with hundreds of other dogs in a shelter. The dogs quite literally run amuck in the streets and certainly know who their enemies are. A path of death and destruction leads our protagonists back together, but their future is uncertain. 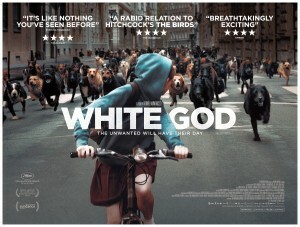 White God is hands-down one of the most fascinating films I have seen. This strange amalgamation of “coming of age,” a girl and her dog, road trek and animal attack film is a rare breed of filmic mash-up that actually works. The visuals are nothing short of stunning as we see Hagen experience the world, not to mention the jaw dropping scenes in which hundreds of dogs run through the streets. The story is top-notch, as well as the acting from both the human and canine cast members. Especially impressive is the choreography of the chase scenes involving the dogs. The last section of the film also has a fantastic sense of dread with its eerily deserted streets littered with abandoned cars and whatever people left as they ran away. I would highly recommend White God for fans of darker films and foreign cinema in general, although I feel that I should give everyone fair warning that this film does contain some slaughter house footage as well as numerous scenes of simulated violence involving dogs. These may be a deal breaker for some people. It is worth noting, though, that the films production reportedly rescued and then re-homed over 250 shelter dogs during the making of this film.